IN 1963, my father, John Miller, decided to chuck a secure job with a windowless office in Amarillo, Texas, and head to the mountains of northern New Mexico, where he dreamed of life atop a pair of skis. I was two, the youngest of three children (though a fourth was soon on the way). Judy, my mom, had skied since she was a child growing up in Colorado. Dad, a native Texan, had spent summers at his family’s cabin in Red River beginning in 1935. He had occasionally “skied” the flats of West Texas, courtesy of a rope and a pickup truck, before formally tackling real slopes while attending the University of Colorado in Boulder. Little did we know that his seemingly harebrained job change would fortuitously place us in the center of New Mexico’s then-small, family-owned, and homegrown ski industry. It was peopled by outsize characters who combined a bit of business sense with a lot of snow-loving gusto. People like Ernie Blake and brothers Jean and Bernard “Dadou” Mayer—giants of New Mexico ski history. I grew up among them, mastering moguls, sipping hot chocolate, and witnessing the growth of an industry that today boasts an annual economic impact of more than $524 million. IT ALL STARTED with my dad’s second career as assistant manager at the Red River Ski Area. He worked there for two years before taking a position as a mining engineer at the molybdenum mine in Questa Canyon. Mom became a part-time ski instructor at Powder Puff Mountain—a beginner ski hill in Red River—and had her hands full taking care of four children. I learned to ski at age four, and I hated it. We learned there at Powder Puff on wooden skis with nearly inoperable cable bindings (at least for a four-year-old) and double-laced leather boots. The chairlift hit the back of my legs as I tried to sit and knocked me down as I disembarked, so we sidestepped up the mountain. Not fun. My turning point came when Dad took me on the “big mountain” at Red River. Was I five? Six? All I remember is putting my feet into a gigantic snowplow and yelling “Whee!” all the way down. More turning points came with the invention of step-in bindings, buckle boots, and “shorty” skis. Here you can imagine a chorus of angels—that’s how significant it all was. NEW MEXICO SKI AREAS have a history of family ownership, and the Enchanted Circle was no exception: Lloyd and Olive Bolander opened the Sipapu Ski Resort in 1953; Ernie and Rhoda Blake opened Taos Ski Valley in 1955; Oklahoman Stokes Bolton opened Red River Ski Area in 1959; and in 1966, Roy and LaVena LeBus opened the Angel Fire Ski Resort. Lester Lewis originated what became Powder Puff as the E-Z Ski Area in 1962. In 1964, he built a chairlift using parts from oil derricks and changed the name to Powder Puff Mountain. The 1970s, the years Mom and Dad owned Powder Puff, were a heady time for skiing in New Mexico. Texans flooded over the state line to learn the sport. Everyone wanted to be a part of it, including then–Red River Ski Area instructor Gary Johnson, later a two-term governor of New Mexico and Libertarian candidate for president. Everybody knew just about everybody, and my family had a front-row seat to this small but soon-to-explode industry. At 11, I went to work teaching kids 3 to 12 how to ski. Using a rope tow just for children, we wore leather protectors to save our gloves from the inevitable shredding. If they needed help, we simply tucked the tykes between our legs and hauled them up the slope, one by one. Ernie was known for his humorously candid radio ski reports, like the one in which he told listeners, with an Austrian accent, “The skiing is lousy, but vee haff plenty of vine and vimmin,” or the time he said wind had blown all the snow off West Basin, where the skiing was terrible, to Kachina Basin, where the skiing was great. Dad was, and is, known for his sense of humor. He once put up a sign that instructed people from Central Standard Time to set their watches back 42 minutes instead of one hour, “because of the altitude.” He got a kick out of watching people trying to make the correct calculations. IN 1979, after he and Mom fell in love with cross-country skiing, they sold Powder Puff, and Dad began offering backcountry lessons and tours in the Upper Red River Valley. Sometimes, he and I would make an expedition over Bull of the Woods to Taos Ski Valley. We’d sit by the fire in the Hotel St. Bernard, built, owned, and operated by Jean Mayer. A onetime French junior national ski champion, in 1956 Jean guided Hungarian and Czech refugees from the Soviet Union over the Alps to safety in Germany and Austria. He then moved to Taos and soon brought over most of his family to help build the St. Bernard. He still takes pride in personally serving his guests breakfast, lunch, and dinner. Maybe you’re among the thousands of people he taught to ski. Maybe you’ve had a freshly grilled green chile cheeseburger handed to you by a man who’s past his 80th birthday and still knows the mountain better than anyone. If you have, count yourself lucky. I know I do. After skiing at Royal Gorge in Soda Springs, California, the largest groomed cross-country ski area in the United States, Dad was inspired to build a groomed area on a plateau atop Bobcat Pass. The Enchanted Forest Cross Country Ski Area opened in the winter of 1985-86 with about 10 kilometers of trails. Today, it’s grown to 33 kilometers of ski trails, 15 kilometers of snowshoe trails, and about three kilometers of dog-friendly trails. Some years, drought and the ups and downs of business made it hard to get by. We were led by optimism and love, I suppose, along with the friendship and support of all those other hardy souls for whom skiing was both their lifeblood and their livelihood. Not everyone made it. Powder Puff eventually closed. Today, it’s a subdivision. 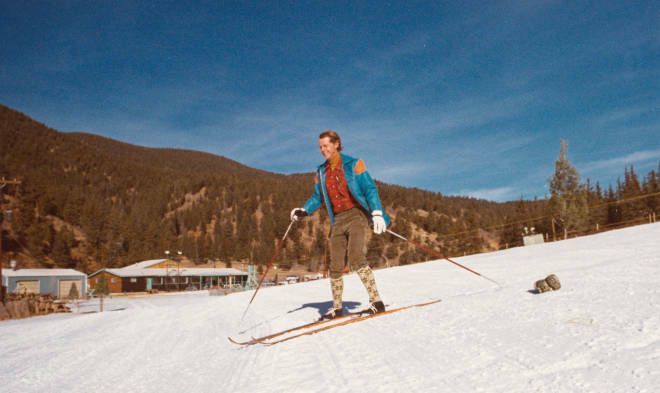 Other old-timey ski areas that didn’t last include Val Verde, outside Angel Fire; Ski Sugarite, near Raton; Cedar Creek and Eagle Creek, near Ruidoso; and Singing River Ranch, near Questa. In 2010, I bought Enchanted Forest from my parents, with Geoff Goins. Sadly, love affairs sometimes end. We’re now looking for the next dreamer who will purchase our ski area and keep it running for years to come. I like to remember those late-afternoon days, growing up, when Dad and I would ski a loop for an end-of-the-day trail sweep. It was mostly an excuse to get out and ski; lost or injured skiers were rare. The truth is, I’ll never pass up a chance to ski on a bright day in New Mexico. Sometimes, if the sun and clouds melded for one of those heart-stopping sunsets blazing above Gold Hill, Dad and I would stop to take it in with reverent awe. This, we decided, was what made all the heartache of “snow farming” worthwhile. In my mind, no matter the time of year, I can still place myself on that trail. Those memories will always have my heart, just as New Mexico will always be my skiing home. Ellen Miller co-owns the Enchanted Forest Cross Country Ski Area. A veteran journalist, she also owns and operates the Sangre de Cristo Chronicle, a digital newspaper in northern New Mexico.